Is tú atáim a rádh anois. Is mian croidhe gach óig-mhná. 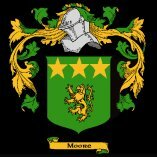 The Moore coat of arms came into existence centuries ago. The process of creating coats of arms (also often called family crests) began in the eight and ninth centuries. The new art of Heraldry made it possible for families and even individual family members to have their very own coat of arms.